Rock Solid Backpackers is very central, a few steps from Tutanekai Street, packed with high-street shops, cafés, Eat Streat with bars and restaurants and each Thursday we host our weekly Night Market here. The Rotorua iSite, Government Gardens, Arts Village, Lakefront, Kuirau Park, Polynesian Spa and local Supermarkets are all within 10 minutes walk from the hostel. Rotorua Airport is 15 minutes by car. Public on-street metered parking is available, with free parking areas just two blocks away. We pride ourselves on giving you the best possible experience during your visit to our bi-cultural city of Rotorua. Our hosts offer local expertise of natural geothermal features, Māori culture and tourism hot spots and can book many activities and tours for you at our Tour Desk. 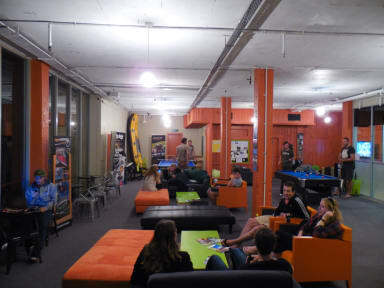 We are the only hostel in Rotorua with the view of a 20m high rock climbing wall, showcased right from our guest lounge. The Wall offer our guests discounted rates! At reception we also offer FREE: WiFi, luggage and bike storage, guest phone and computers, book exchange, guitar, pool table, table tennis, DVDs and towels! Or if you fancy an alternative film head downstairs, to the Basement Cinema complete with a bar. All rooms are cleaned to a high standard. Our dormitories include bed linen, lockers, heating and access to shared bathroom facilities. Our private ensuite rooms also include tea/coffee making facilities. There is a well-equipped, communal kitchen with cooking facilities and complimentary tea and coffee. A valid Photo ID and credit card must be presented upon check-in. O único ponto, é que o beliche na parte de cima é extremamente alto e precisava pelo menos de uma proteção. O hostel fica numa excelente localização, perto do centro e de varias lojas e restaurantes. O ambiente em si é ok, nada de espetacular, o quarto em que fiquei era um tanto velho, a minha cama era antiga e havia algumas manchas de sujeira na roupa de cama. O banheiro era ok, lembra os de academia. No geral, é confortável, mas não memorável. Not a hostel to socialize. When I got there, the women from the front desk was sitting in the common area with her family eating pizza and I thought it was rude to guests. My room was on the second floor and the female bathroom is on the first floor, so every time I wanted to use the toilet or have a shower I had to go to the first floor, so annoying. Didn't use the kitchen. Access to wifi is limited and if you need more you have to buy (5 NZD for 1G).